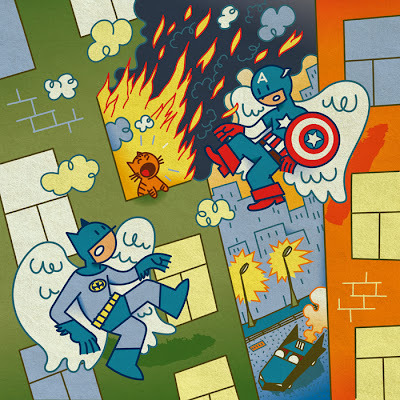 Lindgren & Smith: A Job for Batman and Captain America! A Job for Batman and Captain America! We love the fact that author and creative Doug Snyder thought of Jerome Studer to illustrate for a very moving article about two real life superheroes. Not only was Jerome's style perfect for the assignment, he delivered an engaging illustration complete with Bob the Cat. You can see the superheroes, and Jerome's illustration, in action at guideposts.org. View more of Jerome Studer's work.